Extra online articles at: www.teachyourself.com to give you a richer understanding of the culture and history of Belgium. Unit 2: Where do you live? Unit 6: Do you go to the cinema a lot? Unit 7: What are you going to do? Gerdi Quist and Dennis Strik have extensive experience in language teaching. Gerdi currently lectures in Dutch at University College, London, where Dennis taught Dutch for ten years. Dutch is a West Germanic language spoken by around 24 million people, mainly in the Netherlands, Belgium and Suriname, but also by smaller groups of speakers in parts of France, Germany and several former Dutch colonies. It is closely related to other West Germanic languages (e.g., English, West Frisian and German) and somewhat more remotely to the North Germanic languages. Dutch is a descendant of Old Frankish and is the parent language of Afrikaans, one of the official languages of South Africa and the most widely understood in Namibia. Dutch and Afrikaans are to a large extent mutually intelligible, although they have separate spelling standards and dictionaries and have separate language regulators. Standard Dutch (Standaardnederlands) is the standard language of the major Dutch-speaking areas and is regulated by the Nederlandse Taalunie ("Dutch Language Union"). 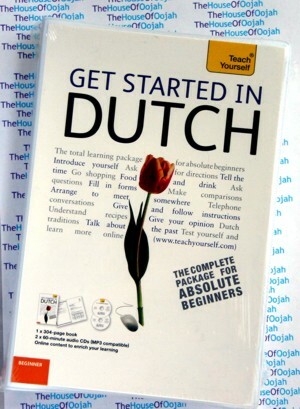 Dutch is also an official language of the European Union and the Union of South American Nations. Dutch grammar also shares many traits with German, but has a less complicated morphology caused by deflexion, which puts it closer to English. Dutch has officially three genders, masculine, feminine, and neuter, however, according to some interpretations these are reduced to only two, common and neuter, which is similar to the gender systems of most Continental Scandinavian languages. The consonant system of Dutch did not undergo the High German consonant shift and has more in common with English and the Scandinavian languages. Like most Germanic languages it has a syllable structure that allows fairly complex consonant clusters. Dutch is often noted for the prominent use of velar fricatives (ch and g, pronounced at the back of the mouth), often picked up on as a source of amusement or even satire. Dutch vocabulary is predominantly Germanic in origin, considerably more so than English. This is to a large part due to the heavy influence of Norman French on English, and to Dutch patterns of word formation, such as the tendency to form long and sometimes very complicated compound nouns, being more similar to those of German and the Scandinavian languages.